carved in high relief, painted and partly gilt. 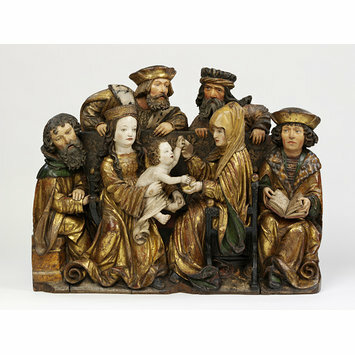 This is a relief made in Tyrol in about 1520. The relief is carved in Stone pine, a soft alpine wood which was favoured in the Tyrol, and gilded and painted. This relief representing the Holy Family shows the Virgin with the Child Christ, St Joseph and the Virgin's mother, St. Anne, surrounded by her three husbands, Joachim, Salomas and Cleophas. This relief, together with Mus. no. 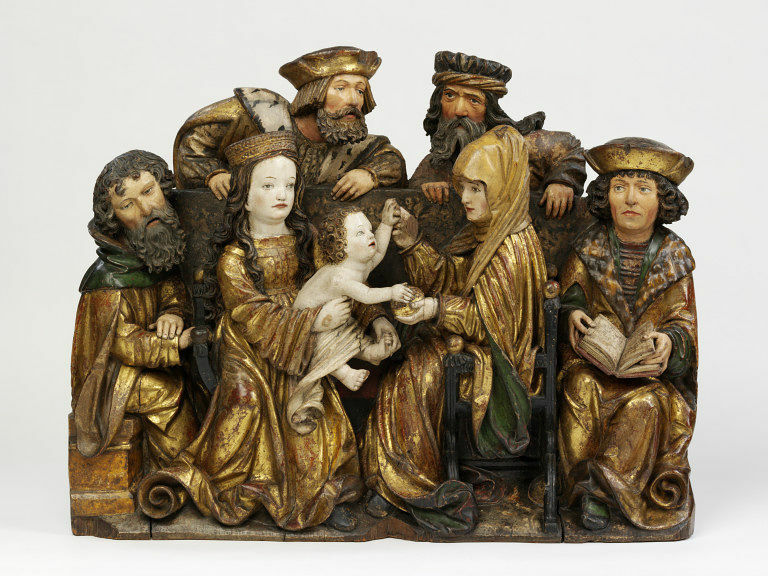 1307-1872, probably formed part of a wing of a large altarpiece, such as the Brixen Altarpiece. THey may have been carved by a sculptor who had been trained in a workshop in Bavaria, but later settled in Tyrol. Said to have come from a church in the Tyrol. Bought from Christie's , London, 7 December 1872, lot 147 for £12. Historical significance: Although the type of wood (pine) was used predominantly in the Tyrol, and their provenance from this area seems certain, the stylistic features of the relief are derived from Lower Bavarian sculptures. This relief probably formed part of a wing of an altarpiece. sits the Virgin, holding Christ, with her mother St Anne. large altarpiece, attached to a painted background.